Have you just started writing your own music? Bewildered by what you don’t seem to know? Don’t know where to start? 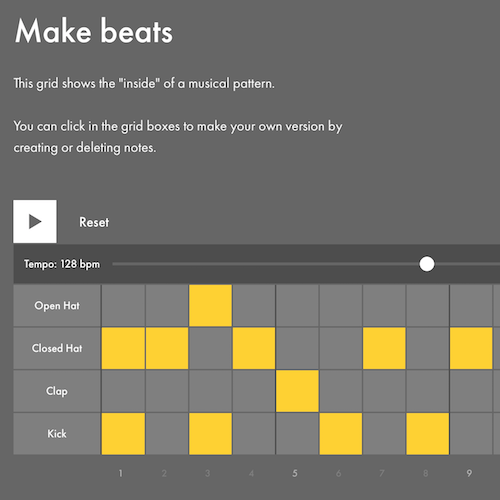 Don’t worry Ableton are here to help with their interactive how to make music guide: Ableton – Get Started. Launched earlier this month Ableton – Get Started like their legendary DAW is intuitively designed to get you writing music as quickly and as easily as possible. If you really don’t know where to start in terms of making drum patterns, selecting sounds, writing melodies, song structure etc then this is the ideal place to start. Admittedly it’s not the only available option as pretty much any production query you may have can either be resolved with a diligent YouTube search, or by stumping up some cash and paying for an online music production course. However YouTube is rarely a comprehensive answer and online music courses can be expensive. Having had a little play with ‘Get Started’ we can confidently confirm that it is one of the most comprehensive, engaging and easy to follow getting started guides we are yet to come across. And most significantly it’s FREE. There are 7 chapters of which the first 6 cover Beats, Notes and Scales, Chords, Basslines, Melodies, and Song Structure. Each of these includes their own sub-categories, all of which include illustrative examples and interactive sounds to help you understand and practice what you’ve just learnt. The seventh chapter ‘The Playground’ is as the name suggests, an opportunity to play. With a detailed and fully interactive platform to practice the skills you have learnt in the preceding 6 chapters. In addition to this anything you create is fully exportable to Ableton Live. A typically astute option from the Berlin based company. Overall ‘Get Started’ is a well thought out, well structured and intuitive tool for anyone cutting their teeth in music production. It is sufficiently detailed that even those of you who’ve been producing for a few years will most likely learn something. Its FREE which makes it a total no brainer, and if we know Ableton there is every chance that ‘Get Started’ is just the start of what will be an ever expanding learning platform. Highly recommended. NextHow To Write a Hit Song – Is Three still the Magic Number?